Happy Thursday! I finally made it to New York and am so happy to be back. Just to update you, I’ll be here until after my birthday (January 6). 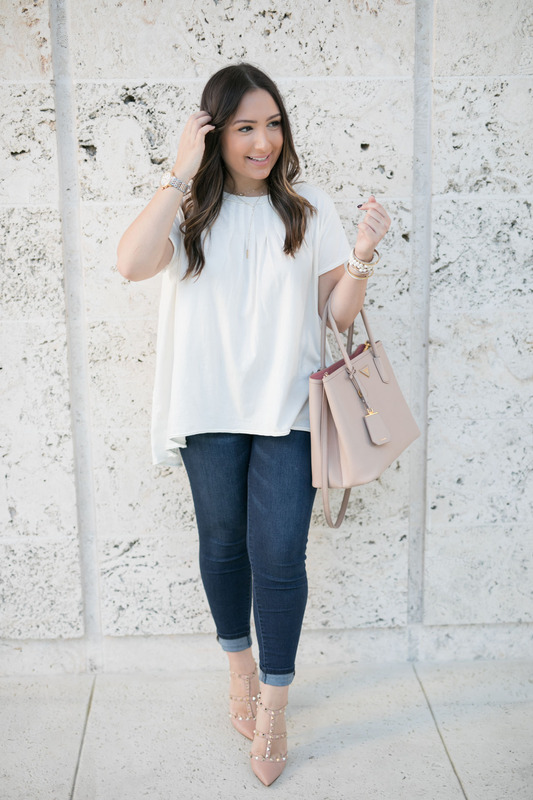 I think I’m going to work on a blog post that’s a bit more personal explaining everything that’s going on in my personal life but for now I wanted to share this adorable high low tee that you know I have been obsessing over! I wore this exact outfit (minus the Valentino shoes) to my nephew’s first birthday and the shirt was a hit. 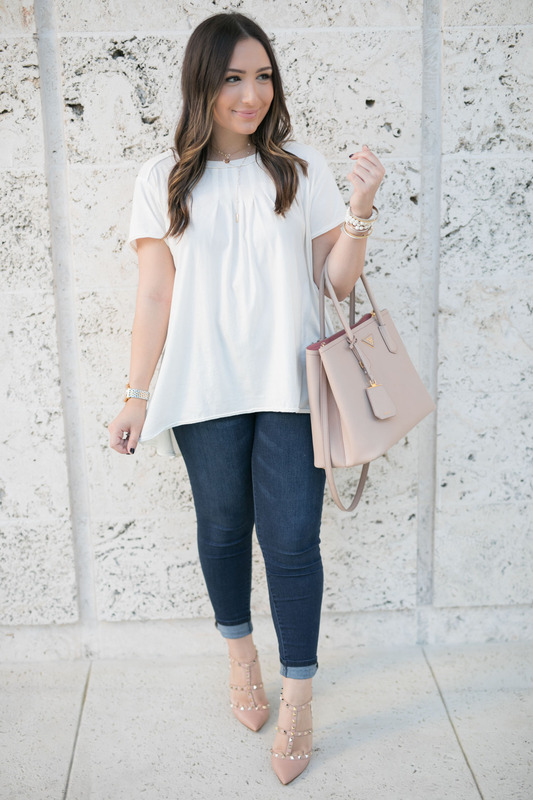 It’s just one of those casual tees that you can dress up (as shown here) or dress down with sandals. It’s also extremely comfortable and I love the fit of it. While I’m wearing an S, I definitely could have gone for the XS. It comes in four colors and is also a great gift to give to the basic-loving-gal in your life! I paired it with my favorite jeans that have saved my life. They have a stretchy waistband that makes them just so comfortable to wear everyday and I want to get them in black, too. They’re extremely comfortable and don’t stretch out like crazy during the day (I hate that) and they’re under $100. I highly recommend them! Add a dainty necklace like this one and you have an easy outfit. Anyways, this weekend I’m doing a really fun shoot with my best friend (blogger who lives in NYC…who can guess who it is?!) and I can’t wait to share it with you! We’ll be sharing everything from holiday drinks, gifts to give, pjs to wear, things to do while having a girls night in and more. So stay tuned for that! What a cute casual tee! So many fun ways you shared to style it. 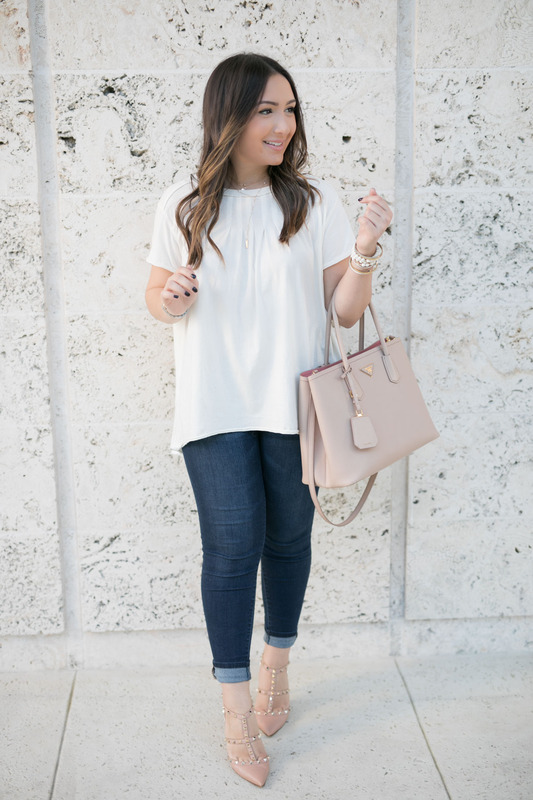 Cute tee, This is the perfect go-to outfit! I love your accessories too. Love your outfit. You can never go wrong with white tee and jeans. You look beautiful in this look!! Love that tee! Cute top gal! Love the jeans you paired with it. Adding this top to my cart immediately! Love this top so much and the detail at the neckline is too cute! 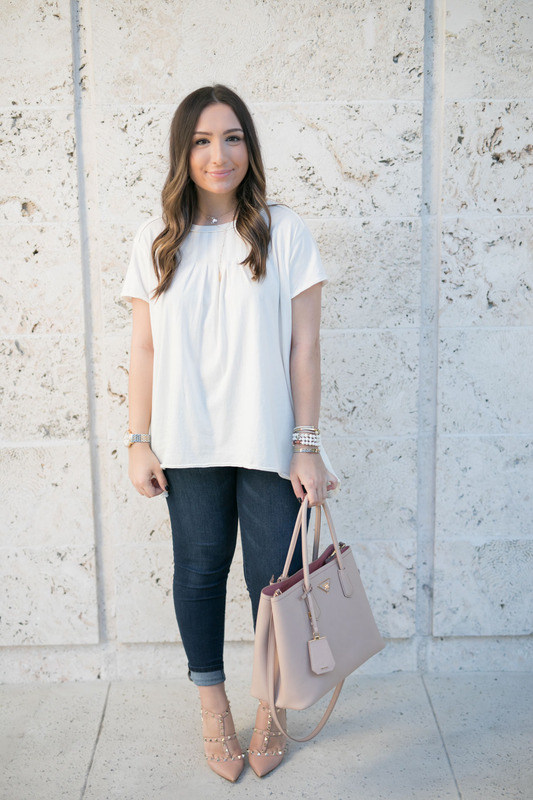 What a great everyday look, white tees are such an essential! You really can’t beat a good statement tee like this one! Love how you styled it! This top is perfect. Simple but would go with everything. Simply beautiful and it is perfect on you! A great white t shirt is always on our list! I love how the back is longer which is perfect for jeans and leggings! Love the bag & shoes match! I absolutely love this outfit. It’s so simple yet so pretty. I love that you can dress it up or dress it down! Definitely would wear!